As much as Dal Nyeo pities Jin Yu for the position she’s in, Dal Nyeo just can’t ruin Tae Jung’s life by insisting he do the right thing by his ex and his baby. I get it, I do. But…I really wish she would make that stand. However…even for her the temptation for a better life is much too great. And Tae Jeong? He hits a new low in this episode. He’s not human, he’s just not. How he could have ever been that nice guy who Sun Yu knew growing up and Jin Yu fell in love with is a total mystery. So, how does Dal Nyeo solve the problem of Ji Hui meeting Jin Yu? Simple. She lies. 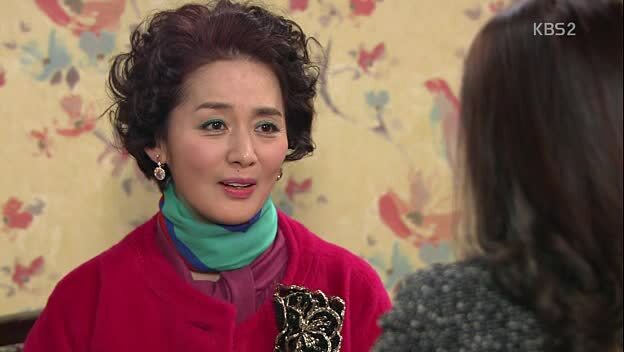 She introduces Jin Yu as her niece. She then quietly apologizes to Jin Yu for doing this for her son and sends her off. Of course Aran is in the vicinity and her radar goes off when she sees the pregnant Jin Yu with Dal Nyeo. She orders her assistant to follow Jin Yu and learn more. Jin Yu recalls the meeting and rubs her stomach. It’s okay. She’s okay. Everything’s going to be fine. Ji Hui then sits down with Dal Nyeo with a large gift basket of fruit. Dal Nyeo asks what the occasion is for and Ji Hui says it is a formal apology as she is worried about Dal Nyeo being upset over Aran’s actions. Dal Nyeo is very happy with the gift and is happy to hear that her soon to be daughter-in-law doesn’t look down on how she’s lived all of these years. Dal Nyeo then tells Ji Hui that she is her real daughter-in-law. Shouldn’t that send warning signals to Ji Hui? She’s not unintelligent after all…well…she is in love with the soulless SOB…so maybe she isn’t all that smart. I do have to say that Dal Nyeo calling Ji Hui her real in-law is low as I really don’t think Jin Yu is the kind of person to look down on Dal Nyeo either. Plus, Jin Yu worked hard to support both Tae Jeong and his mother. Meh. Even when she has a glimmer of humanity, Dal Nyeo manages to ruin it. That night at the convent, Seon Yu and her fellow nun are making their rounds. Children are missing again. Where could they be? It’s almost time for roll call! Lights spring on and kids pop up all over. Jeong In (I’ve been calling her the wrong name Young Ji…don’t know why) has a cake for Seon Yu. She always remembers all of their birthdays and special events. This is the least they can do now that they won’t be seeing her anymore. It’s kind of surprising, but under her rough exterior, Jeong In really does love and respect Seon Yu. It’s a very touching goodbye. Lots of tears and hugs all around. Ji Hui gets a call that her special order is in. It’s watches that she’s been after for months. Apparently this couple set is the only one of its kind and was very hard to get. Ji Hui meets with Tae Jeong who wonders what the special occasion is. Ji Hui hands over the gift boxes and Tae Jeong opens it and doesn’t look 100% pleased. Isn’t the man supposed to buy the gifts in the relationship? Ji Hui says that as she is the who proposed, this seemed fitting. Plus, there’s nothing wrong with her buying it. Tae Jeong smiles, but I don’t think he’s 100% happy still, and says he’s been agonizing over what kind of ring to buy her. He then takes the watch and kneels to put it on. Well…definitely a unique proposal. I kind of like how proactive Ji Hui is. She was the one who proposed and she got couple’s watches as an engagement gift. I guess…even if Tae Jeong is a power hungry social climber…he has his pride. He’s not some… boy toy looking for fancy things. Though, he does seem happy about the watch later…probably because of the connection it symbolizes—his dream is near to fruition. Tae Jeong drops Ji Hui off and just as they might have kissed, Ji Suk arrives. Shouldn’t his sister get out of the car since she’s home? Ji Hui scolds him for interrupting and Tae Jeong gets out of the car to be introduced to his prospective brother-in-law. Ji Suk does recognize him as the man having an argument outside of the company, but since Tae Jeong’s back was to him at the convent, he doesn’t recognize him as Seon Yu’s tormentor. Ji Hui happily says that Ji Suk is on their side. I am sure Ji Suk has no problem supporting his sister…but at the same time, I don’t think he and Tae Jeong will mesh well together, especially since Tae Jeong is all set to plow Ji Suk over for Ji Hui to climb to the top (and himself). Tae Jeong goes to his mother’s house and demands to know why she met with Jin Yu (Ji Hui talked of meeting his pregnant relative). Dal Nyeo said it was the last time as all times have been officially severed now. Plus, she’s good at thinking on her feet. Right. Tae Jeong then tells his mom and sister to sell the house and be prepared to move out as he doesn’t want them in the same neighborhood as Jin Yu’s family as that won’t be good. Dal Nyeo and Tae Mi are all excited about this. Tae Mi wants to move into an apartment or villa where there are rich men. This family. The next morning Granny Gong is getting her blood pressure measured as she needs to monitor it at all times. Wu Hyeon is waiting anxiously by her side. He gets very agitated when the machine beeps and a number great than 140 comes out as he can only count that high. Ji Suk looks at the monitor and reports it’s 143. Wu Hyeon panics and says they should take her to the hospital right away. Granny Gong refuses and asks Ji Suk about work. Ji Suk apologizes. Coming home was hard enough, he won’t be going to work for L Foods. He then leaves and Granny Gong says that it doesn’t matter because she knows he will end up working there on his own. I did love the banter and Granny Gong accusing Ji Suk of being the reason for her high blood pressure and Wu Hyeon insisting his nephew is bad for hurting his mother. Ji Suk goes to his home office I guess and makes a call to Jeong In. He asks after Seon Yu and Jeong In is back to calling her “Hag” again. She tells him that Seon Yu is preparing to leave the convent for two weeks of seclusion before taking orders. She then asks if he will really get her a job like he promised (that doesn’t include being his errand girl). Ji Suk says that he will most definitely keep the promise he made to her. It’s really cute, you know. As hard as Ji Suk argued for the head nun to let Seon Yu stay and take her vows as she would be the best nun ever…he doesn’t want to let her go either. His attachment is really cute. I think part of the reason he likes his feisty nun is mommy issues…plus she is a warm and endearingly forgetful person. Aran runs into Tae Jeong at work and basically likens him to a dog. Good work on landing the contract, here’s a pat on the head. Aran is okay to let him do the dirty work to help her daughter, but is not okay with letting him into the family. Will Tae Jeong be able to grit his teeth, take her insults, and wiggle his way in? Jin Yu gets off the phone with Seon Yu who is coming to spend the night before heading to the new convent. She recalls after Seon Yu beat her cancer and went immediately to the convent where she is now. Jin Yu was very worried about her sister being enclosed there after having just gotten well. Plus…Seon Yu is Jin Yu’s closest family. This is where Seon Yu gives Jin Yu the bracelet. Jin Yu gets up and gets ready to make a meal for her baby sister. You can see how excited she is that Seon Yu will be coming for the night. I love their sisterly bond. I’m really close to my own eonni. As Seon Yu leaves the convent, Ji Suk pulls up. She is happy to see him once again. He’s looking pretty good for a man running from loan sharks. LOL. Anywho, he wishes to repay his debt. Seon Yu doesn’t care about such things and says she has an appointment to keep. Ji Suk then tells her about getting the kids from the convent jobs. This really touches and excites her. So she does end up getting ushered in and taken to a restaurant. Ji Suk promises to hook the convent up so that the kids from their can get reception, waiting, and kitchen jobs. This makes her really happy, but Seon Yi wonders if Mr. Liar can really be trusted. Ji Suk assures her that he can and ushers her in for a meal, which she tries to resist since she’s supposed to be with Jin Yu right now. We then cut to a scene that you know has to be a dream. Ji Hui and Aran are sitting down having a meal with Tae Jeong and Dal Nyeo. They are getting along famously and happily chatting about being in-laws when Jin Yu comes in with the baby to ruin everything. This nightmare startles Dal Nyeo awake and she tries to get in touch with Jin Yu. Aran’s assistant apprises her of the mystery surrounding Jin Yu’s pregnancy and Aran heads over to Jin Yu’s as does Tae Jeong after overhearing Aran and her assistant talking. Who will get to Jin Yu first? The viper Tae Jeong of course! He throws some of Jin Yu’s things in a bag and drags her out of the house (dropping her baby book on the ground). Tae Jeong keeps yelling and cursing his fate and complaining about how bad Jin Yu is. It would be so much better if she and the baby were dead. Jin Yu cannot believe this. He really wants her dead? Sorry, but she can’t do that for him. She is going to live and she is going to raise her baby well whether he likes it or not. The livid Tae Jeong and pulls over on the side of the road and abandons Jin Yu there. The girl then has sharp pains in her stomach and blood is scene dripping down her leg. We then have a truck heading straight for her. Oh no! Jin Yu tries to flag it down, but the man is nodding off at the wheel. Meanwhile, Tae Jeong watches this all unfold in his rearview mirror. But…we all knew that was coming. I really want the baby to live if Jin Yu dies…but that doesn’t look like it will happen. We’ll have to wait and see. I was happy that Jin Yu stood up for herself and her baby and refused to be beaten down by the SOB. Good for her. Too bad she won’t be with us much longer. So were the kids pretending that they were sad during farewell party for SeonYu? Nah, I think they really were sad. Jeong In acts all brusk, but deep down she loves her old “hag” Seon Yu. Ok, coz I was mad when she still called SeonYu hag. It made me wonder was she crying for real? I know, I was a little surprised by that after such a tearful farewell. But, then again, this drama likes having people acting in 180 degree ways. Tae Jeong from the past is completely different from Tae Jeong now and Jeong In can be a sweet girl in one moment and then…the aggravating teen in the next.